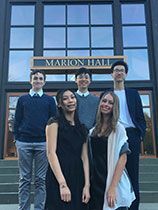 This week five grade 10 students ventured “overseas” to Shawnigan Lake School for the 2019 CAIS Senior Student Leadership Conference, which brought together 120 student leaders and 35 teacher advisors from across the country. Such diversity appealed to Hannah Trotman, who remarked, “Leadership does not have a definition. There are many different ways to be a leader, and both extroversion and introversion work in different situations." Students gleaned important takeaways from keynote speakers, including Val Litwin, President and CEO of BC Chamber of Commerce; Fiona Macfarlane, Chief Inclusiveness Officer and BC Managing Partner at Ernst & Young Canada; and Ruddy Ndina, a civil engineer at Kiewit Corporation and an activist trying to rehabilitate and enhance the infrastructural landscape in Africa.